Learning something new is always a worthwhile way to spend your time. However, learning often involves academia, struggling to focus and pay attention, and painstaking boredom at times. Another worthwhile way to spend your time is by being physically active and exercising. However, exercising is often forced and it’s not fun or enjoyable. At the Modern Ballroom Dance Studio in Woodbridge, our dance classes for adults offer everything that you want without everything that you don’t want. Not only will you learn something new and get better at it over time, but you’ll get moving and burn some calories while having a total blast in the process! That’s an unbeatable combination and it really doesn’t get much better than that. Time and time again, our ballroom dance studio receives positive feedback from people who didn’t have much of an interest in dancing. 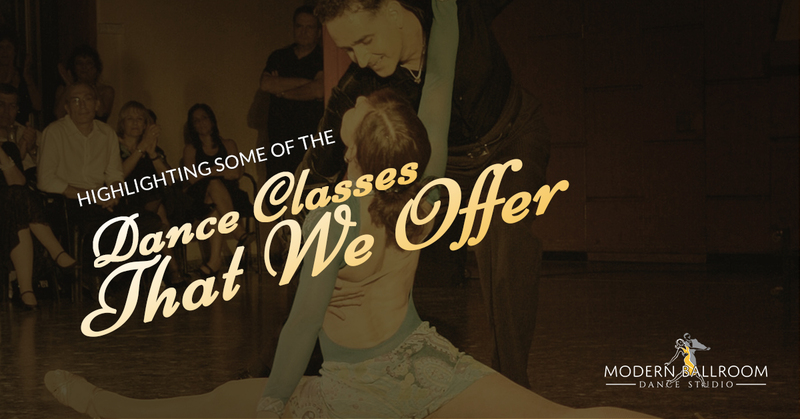 If you’re on the fence about taking one of our adult dance classes in Woodbridge, we encourage you to read more about the types of classes that we offer and see what sounds interesting. It doesn’t matter if you’re good at dancing or not; all that matters is that you step outside of your comfort zone and join us with an open mind. We’ll take care of the rest! Most people are familiar with the basics, or at least the concept, of salsa dancing. As one of the most popular Latin dances in American culture, the “On 1” and “On 2” step for salsa dancing is the most standard form of salsa that’s easily approachable. A couple of margaritas will definitely help your salsa movements as well! For something extremely simple and approachable — more so than salsa — country two-step is a great dance for novices or those who just don’t want to throw down any fancy footwork. The two-step is one of the single most popular country dances in the United States, but if you’re not a huge fan of country music, then we’ll have something else that suits your musical tastes a little better. Get ready for a bit of a heart-pounding workout with this ballroom swing dance. Known for repeated three-steps in rapid succession, east coast swinging is an animated and energetic style of dancing that’s not necessarily for the faint of heart. Some people call the east coast swing the “triple step swing.” This is a great dance to get a good workout in while looking great in the process! Tango dancing is the epitome of class and elegance, but it’s also not ideal for dance beginners (though we encourage people to watch others tango dance, it’s quite the spectacle). Contrast to other forms of tango (such as ballroom tango), the Argentinians prefer fluid movements rather than the choppy, staccato-like movements you’ll see in other tango styles. Otherwise officially known as “cha-cha-chá,” this lively and upbeat style of dancing is as classic as it is fun. More so than most of the adult dance classes that we offer, the cha cha heavily relies on triple-step movement. High energy, high BPM music is generally recommended for the cha cha, though Latin music is traditionally played as the cha cha has Cuban roots. We’ve heard “I have literally zero dancing skills; I’m extremely uncoordinated and I’ll likely embarrass myself” time and time again. We understand that getting into dancing is easier said than done, so that’s why we offer this high-level beginner’s course that’s about as simple and approachable as it gets. No pressure here! Side note: this adult dance class serves as a great date idea if you’re willing to shake things up a little bit. Looking for a little taste of a particular dance without the full-on commitment of an entire class? Our ballroom series is for you. Get Moving at Our Dance Studio In Woodbridge! You’re not getting any younger, and time isn’t going to pass by any slower. Learn something new, burn some calories, and have fun by getting in touch with the Modern Ballroom Dance Studio today!